Elena Ford, in a Ford Motor photo from 2005. Elena Ford will head a newly created global marketing office to unify Ford Motor Co. sales efforts worldwide. Ford, 42, the great-great-granddaughter of company founder Henry Ford, will become the director of global sales, marketing and service operations on Sunday, Feb. 1. She has been executive vice president of global brand and marketing for Ford Motor Credit Co.
She will report to Jim Farley, Ford global vice president of marketing and communications. The global marketing office is the next step in our One Ford vision to integrate Fords worldwide operations and leverage our scale and expertise, Farley said in a release. The new operation follows Fords global consolidation of product development in 2006 and purchasing activities last year. Ford is unifying its global product offerings. The company plans to make all global-segment vehicles common across Fords North American, European and Asian lineups within five years: Fiesta- and Focus-sized small cars, Fusion- and Mondeo-sized mid-sized cars and SUVs, and commercial vehicles. The new global marketing effort will first show up in a multi-market launch of the new-generation Ford Focus in 2010. Ford expects substantial savings in marketing costs using a unified campaign. In a telephone interview today, Elena Ford said her previous marketing and international assignments prepared her for a job channeling all of Ford's product advertising and marketing messages worldwide into a single voice. "The challenge will be to concentrate my efforts on three or four main tasks rather than spreading them over 10," she said. "For one, I'll have one global creative director for each product launch rather than a creative director in each country, starting with the new Focus." On Jan. 12, Ford director of global marketing Anne Belec left the company to pursue other opportunities. A 24-year Ford veteran, she left after about a year in that position. 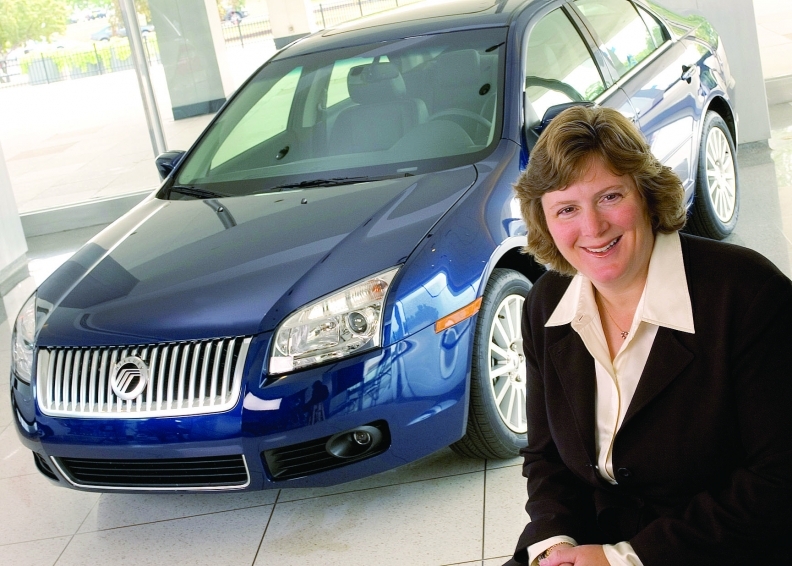 Elena Ford, also the granddaughter of former chairman Henry Ford II, has held four other director-level marketing positions in the automakers North American or international operations since her first assignment as a Ford brand truck advertising specialist. She was a senior account executive for Wells, Rich Green Advertising in New York before she joined Ford in 1995. DEARBORN, Mich., Jan. 27, 2009 – Ford Motor Company today announced changes to its Global Marketing organization to create a more consistent and compelling connection with customers worldwide, while better leveraging the companys global assets and capabilities. Leading the effort will be Elena Ford, 42, who has been named director, Global Marketing, Sales and Service Operations, reporting to Jim Farley, Ford group vice president, Marketing and Communications. Elena Ford, who is currently executive vice president, Ford Motor Credit Company Global Brand and Marketing, begins her new assignment Feb. 1. This marketing approach follows consolidation of Fords global product development activities in 2006 and global purchasing operations in 2008. It also reflects an aggressive move to global vehicles. All Ford vehicles competing in global segments will be common in North America, Europe and Asia within the next five years. They include Fiesta- and Focus-sized small cars, Fusion- and Mondeo-sized mid-size cars and utilities, and commercial vans.  Leading Fords Global Marketing, Sales and Service Operations to drive commonality and standardization of marketing resources. This includes integrating the companys marketing team members, global agencies and other supplier partners with a common and integrated plan to bring new global vehicles to market.  Driving a governance process on strategic and operations matters across Marketing, Sales and Service.  Enhancing Fords brand image around the world.  Driving greater presence of the Ford brand at global auto shows and other consumer-facing events to create a more experiential connection with customers.  Expanding the offering of Ford-branded licensed merchandise around the world. The new Ford Focus global small car – which will be introduced in North America, Europe and Asia nearly simultaneously in 2010 – will be the first vehicle to benefit from global coordination. The new Focus introduction will build on lessons learned from the current launch of the new Fiesta, the companys first global product under its One Ford vision. In addition to a more consistent and higher-quality communication of the new Focus around the world, Ford expects that a globally integrated marketing launch will result in millions of dollars of cost savings. Elena Ford joined the company in 1995 as the truck advertising specialist for Ford Division. She has held marketing leadership positions representing all regions and brands around the world. Prior to her current assignment at Ford Credit, she has served as: director of North America product marketing, planning and strategy; director of North America product marketing; director of Ford Division product marketing; and director of Business Strategy for International Automotive Operations. Before joining the company, Elena Ford was a senior account executive for Wells, Rich Green Advertising in New York. She is the great-great-granddaughter of company founder Henry Ford.